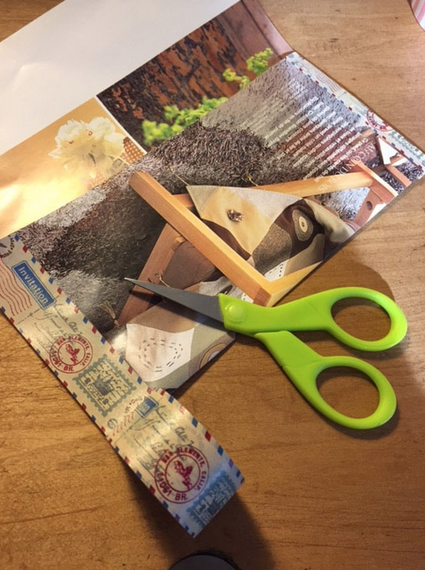 I designed these DIY envelopes from magazine pages a few years ago and have had fun creating them. They can be used not only for sending letters, as most of us don't do much of that any more, but also for organizing receipts, lists, paper clips, stickers, stamps, and children's art. I have always loved magazines and used to buy a lot of them. I grew up around magazines, because my mom liked them too, and subscribed to several. These days I'm selective about the ones I buy because they can accumulate fast. However, in order to keep paper at bay in my house, sometimes I tear out the pages I love, put them all in a binder, and then recycle the rest of the magazine. When I thought about all those colourful pages heading out the door, I had an idea. I love all things pretty, like stationery and art related paper so the idea of making my own envelopes from magazine pages was a natural. 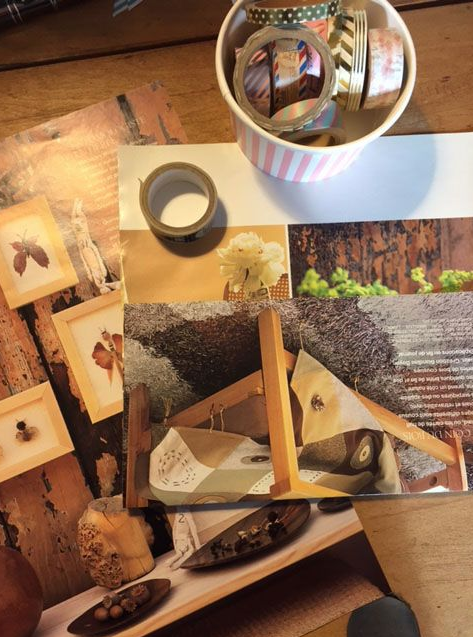 Here you can see a couple of the pages that I've torn from one of the magazines. I knew I'd never make the craft shown on the pages so it didn't seem like a great loss to sacrifice them. 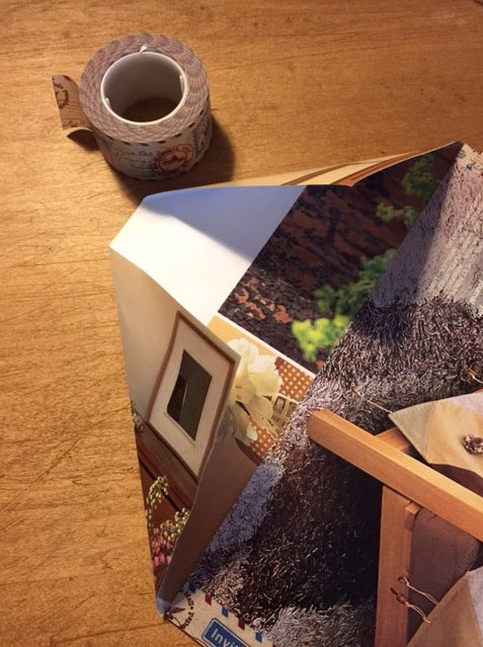 First, I trimmed the ragged edges straight with my paper cutter — scissors work too. 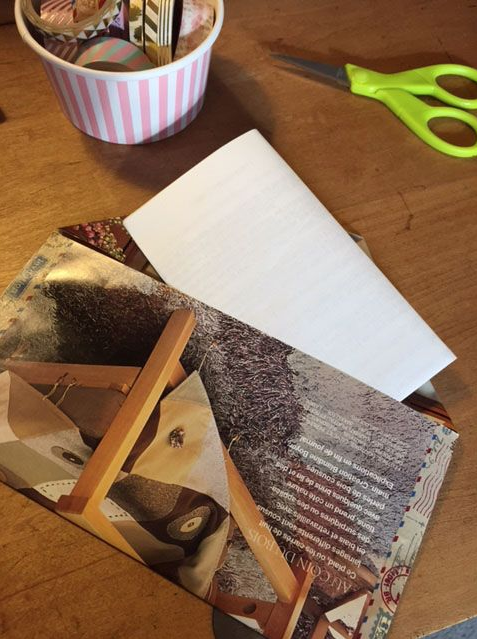 Then I folded one of the pages in thirds, about the size for an envelope. Easy, right? Using washi tape, which you can find at craft and paper stores, and on my Amazon link, I taped the ends of the folded part to close them. 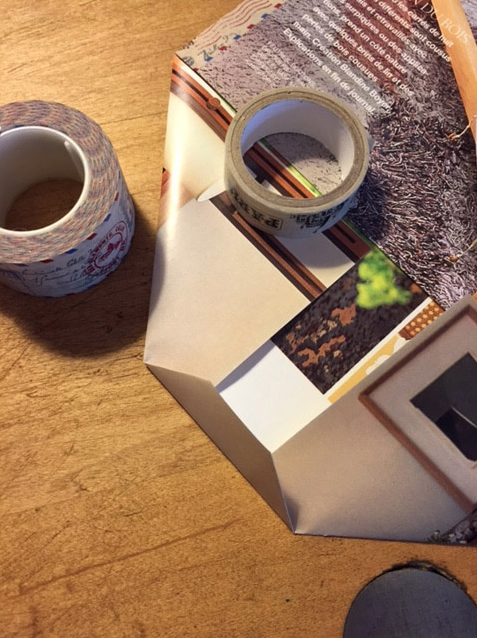 This simply required placing half the width of the tape along the paper's edge, cutting off the free ends, and folding it over the edge. I chose a tape with colours that coordinate with the colours on the paper, in this case stamps and postmarks in French. Apropos, oui? To make the flap, I folded the top corners in to meet up with the top of the pocket. You can cut these off if you like but I like a neat folded edge. I like how the interior of the envelope is full of photos in colour, too They make a nice little surprise when the letter is opened. 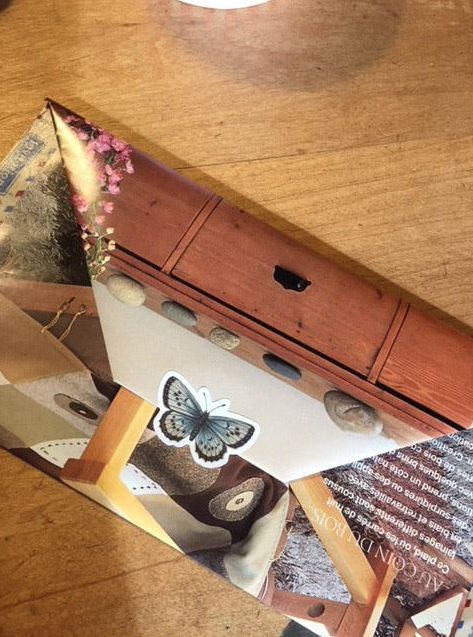 I also folded the "point" of the flap so it has a neat edge, like you would if gift wrapping. You can see in the photo below that all you have to do is pop your letter into the pocket of the envelope then fold down the flap. I just happened to have a pretty sticker and I've recently added stickers to the store. Choose something that works with the colours on the envelope. You could also use a glue stick to seal the edges of the flap, which is probably a good idea as well. It turned out that a white space appeared above the butterfly sticker so I could write a return address there. To make the flap, I folded the top corners in to meet up with the top of the pocket. You can cut these off if you like but I didn't bother. I like a neat folded edge. On the front, if the graphics are too busy, you'll probably want to affix a mailing label sticker for the address. 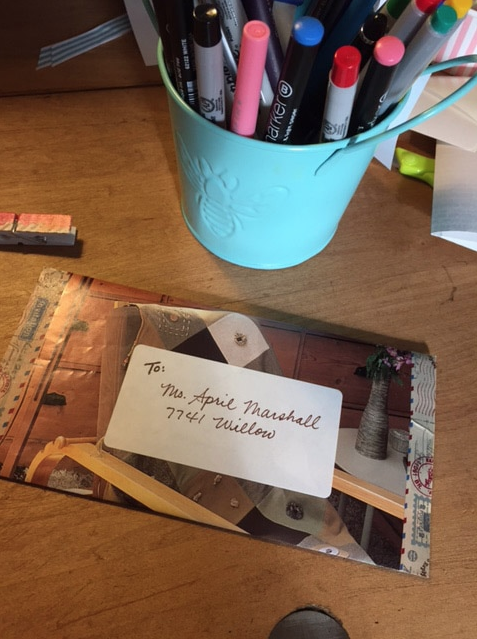 I made up this name and address, so my apologies if April Marshall really exists and lives at 7741 Willow. Voilà! A beautiful, unique envelope that takes only minutes to make.